In the aftermath of the Great Recession, the U.S. home improvement industry has fared much better than the broader housing market, according to our new report. 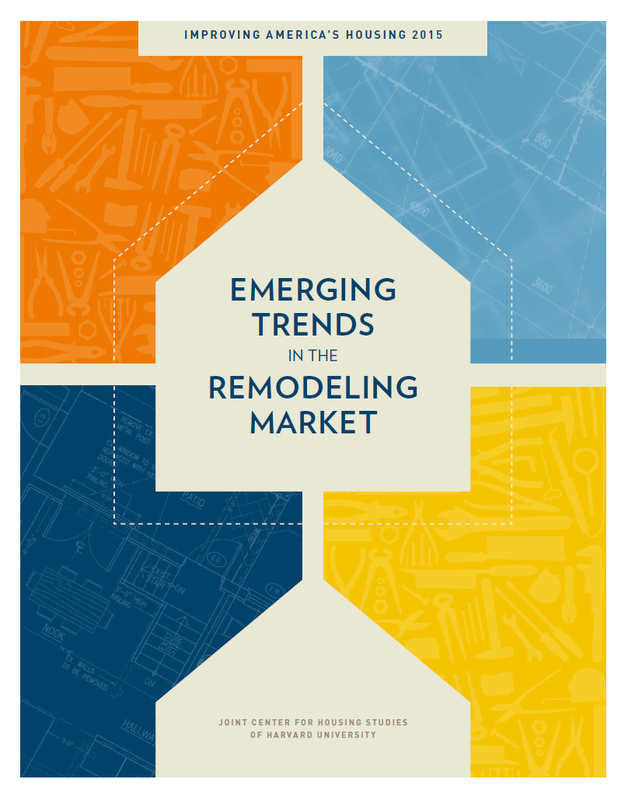 Emerging Trends in the Remodeling Market. While residential construction is many years away from a full recovery, the home improvement industry could post record-level spending in 2015. A number of factors have contributed to the strengthening remodeling market: following the housing bust, many households that might have traded up to more desirable homes decided instead to improve their current homes; federal and state stimulus programs encouraged energy-efficient upgrades; and many rental property owners, responding to a surge in demand, reinvested in their properties to attract new tenants. Additionally, with the economy strengthening and house prices recovering, spending on discretionary home improvements (remodels and additions that improve homeowner lifestyles but which can be deferred when economic conditions are uncertain) rose by almost $6 billion between 2011 and 2013, the first increase since 2007. Improvement spending, however, has not been evenly distributed across the country. Homeowners in the nation’s top 50 remodeling markets accounted for a disproportionately large share—nearly 60 percent—of overall improvement spending. 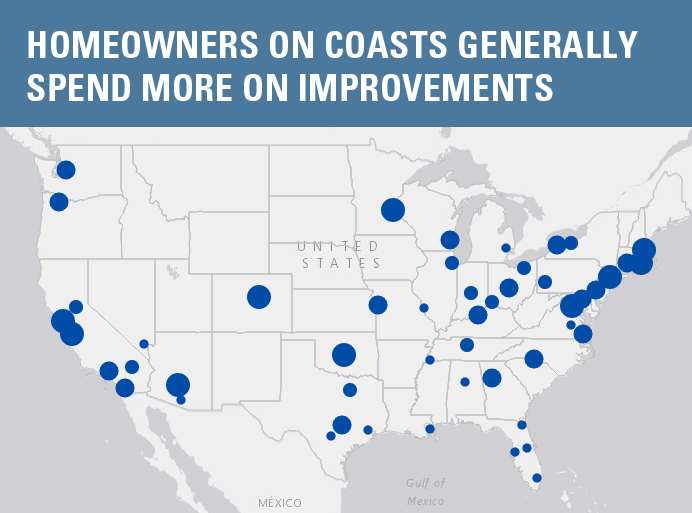 Thanks primarily to their higher incomes and home values, owners in metro areas spent 50 percent more on improvement projects on average than their non-metro counterparts in 2013 (see interactive map). Looking ahead, there are several opportunities for further growth in the remodeling industry. The retiring baby boom generation is already boosting demand for accessibility improvements that will enable owners to remain safely in their homes as they age. Additionally, growing environmental awareness holds out promise that sustainable home improvements and energy-efficient upgrades will continue to be among the fastest growing market segments. Download the full report, infographic, and media kit. There seems to be a remodeling boom in my area as of late. The local public housing projects, tailor parks, and many individuals have been remodeling. It seems that everyone wants to improve their homes in the most cost efficient ways possible. This includes looking on home improvement blogs for do-it-yourself projects and other ways to save money. I suppose everyone wants an upgrade. Drawing from the ongoing research and analysis of the Harvard Joint Center for Housing Studies, Housing Perspectives provides timely insight into current trends and key issues in housing. We dig deeper into the housing headlines to discuss critical issues and trends in housing, community development, global urbanism, and sustainability. Posts are written by staff of the Joint Center, drawing from their wide-ranging knowledge and experience studying housing. We hope you will follow Housing Perspectives, and we welcome your comments. Receive our newest blog posts in your inbox. The opinions expressed in Housing Perspectives do not necessarily represent the views of Harvard University, the Policy Advisory Board of the Joint Center for Housing Studies, or any other sponsoring agency. The Joint Center welcomes comments to our Housing Perspectives blog. Any opinions expressed in posted comments, or in guest blogs, are those of the authors and not those of the Joint Center for Housing Studies of Harvard University or of any of the persons or organizations providing support to the Joint Center for Housing Studies. Comments are generally not edited but are reviewed for appropriateness, and normally post within a day. The Joint Center reserves the right to delete or decline to post comments that are off-topic, illegal, or otherwise objectionable or injurious. Commenters are fully responsible for the content they submit, and indemnify Harvard University and the Joint Center for Housing Studies against any losses, damages, or costs resulting from any claim relating to material they have posted. We require commenters to sign their comments with their real names. All comments and postings are the property of the Joint Center and may be used by the Joint Center at its discretion.